BC Repair Rescue Reviews | Does BC Repair Rescue Work? Our hair is a very versatile component of our physical selves, one that allows us to experiment and become adventurous at the drop of a dime. Changing the shape of one's body or mind can take a great deal of time and dedication, but our hair is far more easy to manipulate. Though, this manipulation doesn't completely come without a price. A lot of us have altered our hair's texture and color since we were adolescents. While constantly switching up your look can be fun, it can also result in the hair's degradation over time. Dry, brittle hair is a often a direct result of over-processing with heat and chemical treatments. People who routinely bleach their hair are especially susceptible to adverse results. To combat this, a lot of people are eager to find a quick fix, but unfortunately this isn't very realistic. A lot of companies make grand claims that their products can deliver restorative results on hair that is already damaged, but typically, such products only act to lubricate the hair without providing any penetrative properties. Does BC Repair Rescue Work for Hair Repair? BC Repair Rescue is actually a line of several products that claim to treat damaged hair while also preventing future breakage. Some of the products include Sealed Ends, which is a formula specifically for treating split ends, and the Intense Leave-In Treatment, which is supposed to offer a nourishing conditioning system that will give hair life and moisture. While many of the BC Repair Rescue products can condition satisfactorily, it's not conclusive that they can actually reverse hair damage. Especially in the case of split ends, it's impossible to get a broken hair shaft to knit itself back together. Such claims are merely inaccurate and misleading. It's more likely that the products can help shield future damage by acting as a barrier from heat, but as with any protectant, the effects are only temporary and won't grant miracles for hair that is already heavily damaged. 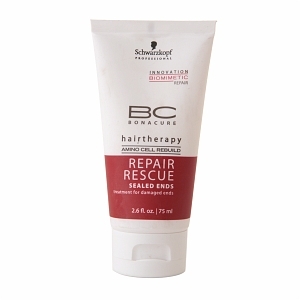 Many customers have reported that BC Repair Rescue Results succeed in protecting their hair from further damage. However, some products appear to be rather hit-and-miss. Customers have reported having a greasy feeling with some products, so those with very fine or oily hair may find that these solutions aren't compatible. Some customers also report ordering treatments online and receiving products that are quite lackluster and watered down in comparison to what was purchased in-store. It's unclear if this is due to a change in manufacture or the disbursement of counterfeit product, but there's definitely a lack of consistency with BC Repair products on the market, so it's important to be careful before making an investment. Also remember that in order to maintain the healthiest hair, you really must cut down on using abrasive treatments while also eating a diet that is fortified in essential vitamins that will make your hair naturally strong. Products in the BC Repair Rescue line can be purchased online or in beauty stores like Ulta. For an in-depth look at other hair-treatment options, click here.